Now, Tim Burton has re-imagined the Disney classic as a live-action film, enhanced with animatronic and digital effects. Dumbo’s story begins in 1919, when he’s born into a struggling barnstorming circus, owned by Max Medici (Danny DeVito), and soon separated from his protective mother. 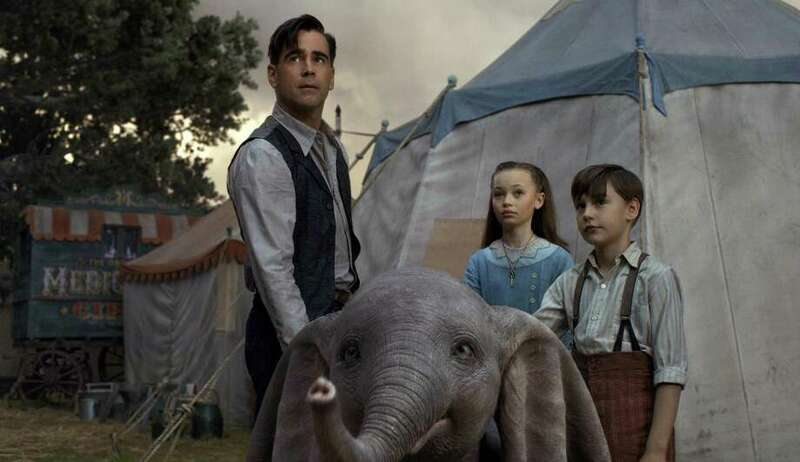 Dumbo’s care is turned over to former equestrian star Holt Farrier (Colin Farrell), a World War I veteran who lost an arm in battle and his wife to an influenza epidemic. Farrier’s two kids — Milly (Nico Parker) and Joe (Finley Hobbins) — quickly realize that the baby pachyderm’s oversized ears, which make him look deformed, actually enable him to fly. Dumbo’s talent soon attracts the attention of nefarious entrepreneur V.A. Vandervere (Michael Keaton), who buys Medici’s entire circus just to acquire Dumbo, pairing him with his French aerialist girlfriend, Colette Marchant (Eva Green) in an ill-fated trapeze act. Vandervere’s amusement park, called Dreamland, bears an eerie resemblance to Disney World, which was originally inspired by Copenhagen’s Tivoli Gardens. Tim Burton’s demented visuality emerges inside its World of Science, where a “bright future’ shows a cross-dressed couple in an ultra-modern kitchen. Based on the children’s fable by husband-and-wife Helen Aberson and Harold Pearl, Ehren Kruger’s clumsy script doesn’t give its colorful “circus” characters much depth, although the ethical animal-rights issue is deftly handled. Without doubt, the best parts revolve around the fantasy of a flying elephant, with its big, blue eyes and remarkably expressive face — particularly when fearful Dumbo is hoisted to the top of the circus tent, balancing precariously on a small platform. Yes, it’s computer-generated imagery but it looks so remarkably real! On the Granger Movie Gauge of 1 to 10, “Dumbo” is an endearing 8 — fun for the whole family.